Just as pictured. Love the boho vibe this adds to my sofa. It’s a bit larger than I thought it would be but it looks way more high end than the price. The Patan Pillow epitomizes global-inspired design with its shag-rug fringe detailing and earthy hues. Designed in Los Angeles and hand-crafted by skilled artisans in India, this pillow depicts the eclectic flair of Asian and African cultures. Give into the inviting appeal of the pillow's plush down-filled comfort and transitional vibes. Dimensions 5.0 In. X 22.0 In. X 22.0 In. I am an overstock associate and was given this product to test and write an honest review. I love this throw pillow. It is great and it can stand up to a 9 year old and at the same time look fantastic on my leather furniture. Beautiful pillow. Love this pillow. Very nice quality. The cover comes wrapped separately from insert. The cover is heavy and well made. I would definitely buy from this line again. Would recommend to a friend. Beautiful, well made, and stylish pillow! The pillows initially have a chemical smell which goes away within about a week. 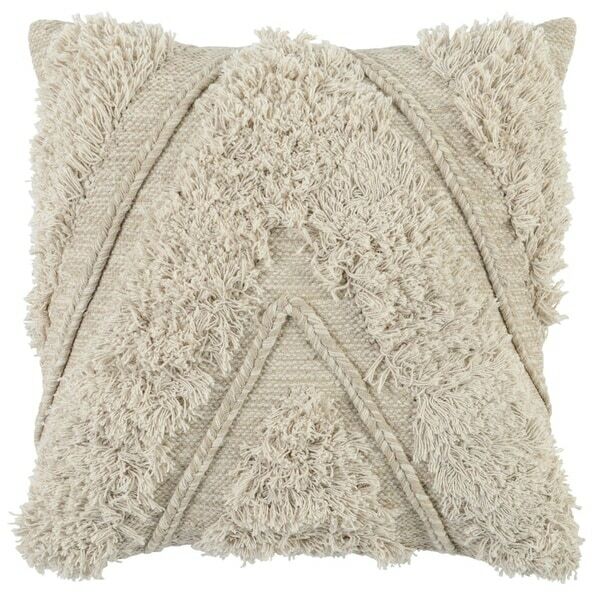 The pillow design is a great neutral and really lovely but the down pillow insert is not fluffy and should be better quality for the price of the pillows. This pillow is so unique. It seems to be really nice quality and hopefully it will last a long time. The color is almost canvas but it is fairly soft. Make sure you read the dimensions as this pillow is quite oversized. Beautiful pillow that coordinates well with two Safejiah pillows. My brown coach now looks extraordinarily beautiful. Love the look. Highly recommend.